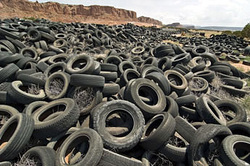 Worn out used tires are taken off of vehicles daily across the world and discarded, and are readily available, mostly free for the hauling. They're not usable to drive around on but the majority of them still have good structural strength. ​Tires come in various diameters and widths. Sorting is necessary to haul only the size(s) you need, unless you bring them all home and plan projects around what you end up with (that's what I do!). 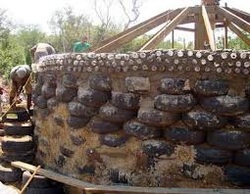 Rammed earth tires, such as are used in Earthships, make great retaining walls and thermally efficient housing. They involve some labor to fill and pound, and some skill to place them correctly according to size,but are eternal once set in walls. I've made several septic tanks from tires and recommend them for that purpose as well as houses. In many areas of the world, building codes ban all use of tires, etc. in building. This technology is usually considered low quality or only for the desperate. I think if one day we decide to make intelligent this world of ours, we will see whole subdivisions of homes where only alternative materials are allowed to be used there within said development. This way, we could dispel all the foolish notions about alternative building systems and actually push the envelope of structural design forward. If we won't talk population control as a society, housing the masses will become imperative to keep peace in the world. The resources simply don't exist to build conventional housing out of new, traditional,manufactured products for the millions of the earth's residents living in poor conditions. Here at our ranch in Baja California, we have begun to experiment with unfilled tires. I call the method M-T tire building. Placing steel reinforcement vertically and horizontally outside the tire and plastering over it all, the result is quite strong . The somewhat floppy aspect of many empty tires leads one to believe they wouldn't be of much use to make structures, but this is just not true. This way of building with tires won't resist the entrance of thermal energy, so is of questionable value for house wall applications in colder climates, requiring added insulation in most cases. But it saves lots of work beating tires with big heavy sledgehammers (classic Michael Reynolds Earthship method), and can, at the very least, be employed where thermal performance is not so important. I've coined the phrase "dead tires" to describe the tires that my workers put aside and call useless when we are forming walls. These are the treads that are sun-baked and hard to open to pack with soil, and the ones that are shredded, torn, etc., that end up at every tire shop in the world when someone extracts the last bit of life out of the tire. Placed in walls woven tightly together and plastered over, they become very strong. Wall of empty tires and old pallets. Tires also make quite useful molds for posts and columns as stay in place forms, with rebar placed in the center before filling.They come out very tough. Don't worry about trying to make the mix enter completely into the tire's cavity. Just dump into the column a somewhat watery mix so it can be sure to flow nicely inside the cylinder,.....forming for instance, in the case of a 15" tire, a 15" diameter round pillar, plus what might flow into the tire.....comes out pretty tough. Detractors and nay-sayers of tire usage for building say tires have free toxic agents and are subject to "off-gassing". To this date, I've not seen any hard evidence supporting that contention. Nor have I ever noticed any bad odor in my 20 years of living in tire structures. New tires have a smell, yes. I die every time I see someone put their house on earthbags instead of tires, often because of unjustified tirephobia-related fears, I think. ​Rammed earth tires are a great form of foundation for building, and utilizing them in construction prevents them from ending up thrown everywhere. Can it be that hard to see the greatly superior strength of steel belted tires compared to thin bio-degradable bags for containing soil and supporting tons of house weight in foundations??? People filling thin bags with soil....better plaster over them quick before the sun toasts them & they fall to pieces, as happens here every time the bags see sun for a month or so. To the contrary, tires that have been in the sun here in Baja for several years are still tough as nails.